Bryce Canyon is the ultimate setting to go for a Horseback ride! When visiting this beautiful one of a kind area, please keep in mind that Horseback riding is not just a pastime for the locals but a way of life. These same hills you drove by on your way to and from Bryce Canyon National Park have historically been hideouts for famous western outlaws like Butch Cassidy and his outlaw gang. If you can imagine that not to long ago there were not paved roads through this country and the way you traveled to see this natures wonder of Bryce Canyon was by horseback. Alone. As you can see from above there is many options when looking into going on a Horseback ride through Bryce Canyons trails. There are not to many farms or ranches you will pass by in the Beautiful country that do not have plenty of Horses on hand and most of which run tours and lesson. Please take a look at the links provided above for more information and at what options you may have. 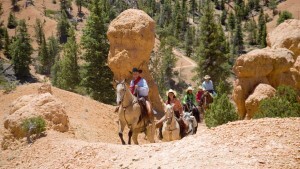 Their wranglers take riders of all types and levels right in Bryce Canyon every day. They love the beauty of the country and the camaraderie of people. They are committed to your service and safety. This is their country and they want to share it with you. Retrace trails taken by the notorious outlaw Butch Cassidy. Discover the hidden secrets of Red Canyon and the solitude of the Wild West! Take your family on this Western experience that they’ll remember for years to come! Choose from our half hour, hour, half day, full day rides, and our 3 day horseback fishing trips. Whichever ride you go on, you’ll be surrounded by beautiful red rock mountains, Ponderosa Pine trees, and hidden waterholes. All horseback rides at Zion Ponderosa Ranch Resort are conducted by East Zion Adventures. We offer 1 to 2 hour rides. We offer 5 different rides. Come to our website to look at the different rides we offer. We know there is a little bit of cowboy in all of us. So saddle up with the rest of us for an unforgettable seven day horse ride vacation through some of the most beautiful and breathtaking landmarks in the world. Truly, mother natures best!